Eric Lionel Mascall OGS (1905 -1993), a priest of the Church of England, a theologian, formidible scholar, Thomist philosopher, staunch Anglo-Catholic, and prolific writer, was known for his brilliance at mathematics from an early age, winning a scholarship to Pembroke College Cambridge where he took the Mathematical Tripos. 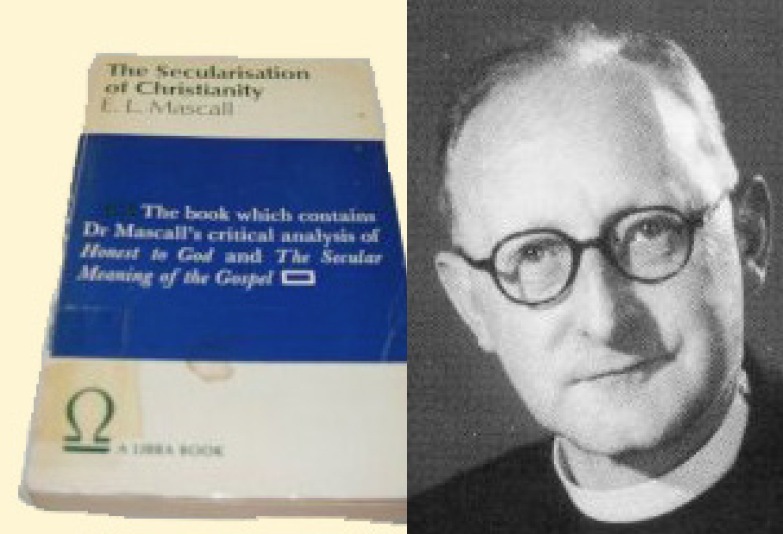 One of the most significant books written by Mascall is THE SECULARISATION OF CHRISTIANITY: AN ANALYSIS AND CRITIQUE (London: Darton, Longman & Todd, 1966). It is a systematic and methodological study of the arguments used by J.A.T. Robinson in Honest to God, and Paul van Buren in The Secular Meaning of the Gospel. Here are some passages from Mascall’s book, which, although out of print, is not difficult to find second-hand. I hope that at least some of my readers will be inspired by these passages to try and find a copy for themselves. If we are prepared to admit, even as a possibility, that Jesus was divine, or even that without being divine he was unique, then we must, as a matter of logic, discard any attempt to discredit the Gospel accounts on the ground that they record abnormal occurrences [i.e. miracles]. (p. 211-212). In my youth I became familiar with the J.B. Phillips New Testament, and some of its striking translations (more properly, paraphrases) are permanently and helpfully lodged in my mind. I shared one of them on this blog a couple of weeks ago . . .
J.B. Phillips (1906-1982) was a priest in the Church of England, remembered for his skill in communicating the Gospel message in fresh and memorable ways. During World War II he used his time in the bomb shelters during the London Blitz to begin a translation of the New Testament into modern English, starting with the Epistle to the Colossians. The results appealed to the young people of his day. After the war he continued to work the rest into colloquial English. Phillips also translated parts of the Old Testament. In 1963 he released translations of Isaiah 1-39, Hosea, Amos, and Micah. This was titled Four Prophets: Amos, Hosea, First Isaiah, Micah: A Modern Translation from the Hebrew. After that, he did not translate the Old Testament any further. He often spoke of the revelation he received as he translated the New Testament, describing it as “extraordinarily alive” unlike any experience he had with non-scriptural ancient texts. He referred to the scriptures speaking to his life in an “uncanny way.” His other triumph - by the all-sufficient grace of God - was that he remained faithful to his vocation and ministry while at the same time enduring crushing bouts of real depression. In addition to his translation work, Phillips wrote a number of books in which he shared the impact of the Gospel on his own life. 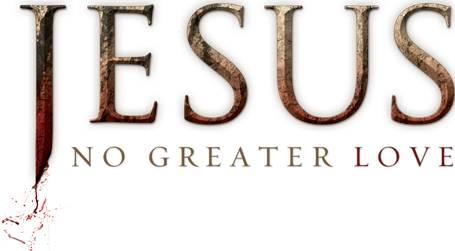 Here are some passages about Jesus, who he is, and the difference he can make if we surrender to his love. It is, of course, impossible to exaggerate the importance of the historicity of what is commonly known as the Resurrection. If, after all His claims and promises, Christ had died and merely lived on as a fragrant memory, He would only be revered as an extremely good but profoundly mistaken man. His claims to be God, His claims to be Himself the very principle of life, would be mere self-delusion. His authoritative pronouncements on the nature of God and Man and Life would be at once suspect. Why should He be right about the lesser things if He was proved to be completely wrong in the greater? Much of today’s Christianity is almost completely earthbound, and the words of Jesus about what follows this life are scarcely studied at all. This, I believe, is partly due to man’s enormous technical successes, which make him feel master of the human situation. But it is also partly due to our scholars and experts. By the time they have finished with their dissection of the New Testament and with their explaining away as “myth” all that they find disquieting or unacceptable to the modern mind, the Christian way of life is little more than humanism with a slight tinge of religion. I have just read Dr Brant Pitre's book, JESUS THE BRIDEGROOM. Written for the non specialist, it is really a 200 page Bible study on nuptiality, demonstrating that the bride-bridegroom imagery of Scripture is the fundamental undergirding symbol or icon of the Christian revelation, and not just one set of optional (and disposable!) metaphors that might have helped people in less enlightened ages than ours. 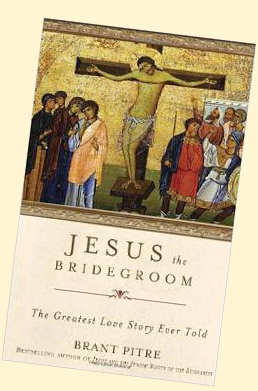 I recommend JESUS THE BRIDEGROOM to all who might not grasp the violence done to the very basics of the God-given iconography at the heart of the Christian faith by the purported ordination of women priests and bishops. As John Saward said in his 1977 paper "Christ and His Bride", "He who images the heavenly bridegroom must be male." For many Christians the Lord's Supper is primarily a “memorial” of the Last Supper and the events of the night on which Jesus was betrayed. 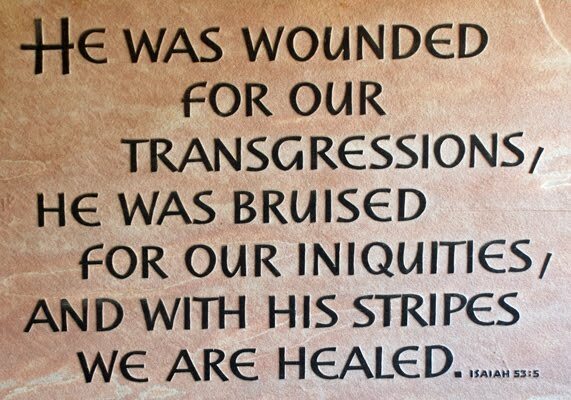 As Jesus says: “Do this in remembrance of me” (Luke 22:19; 1 Corinthians 11:24-25). For others, it is a banquet of “thanksgiving” (Greek eucharistia) offered to God in gratitude for the gift of salvation, in union with Jesus, who “gave thanks” (Greek eucharistesas) over the bread and wine before he died (Matthew 26:27; Mark 14:23). For still others, the Eucharist is primarily a sacrifice, in which the bloody sacrifice of the cross is made present through the unbloody offering of bread and wine, as described by the apostle Paul: “The cup of blessing which we bless, is it not a participation in the blood of Christ? The bread which we break, is it not a participation in the body of Christ?” (1 Corinthians 10:16). However, when we look at the mystery of the Eucharist through the lens of Jesus’ passion and death as the Bridegroom Messiah, another meaning comes to light. If Jesus is the Bridegroom and the Church is his bride, the Lord’s Supper is not just a memorial, or a banquet of “thanksgiving,” or a sacrifice; it is also a wedding banquet in which Jesus gives himself entirely to his bride in a new and everlasting marriage covenant. One doesn’t have to look very hard or long to find abundant evidence in ancient Christianity for the understanding of the Eucharist as the wedding banquet of Christ and the Church. In other words, the book of Revelation is deliberately describing the heavenly banquet of the kingdom of God in terms that are evocative of the Lord s Supper, to which Christians are invited and for which they should prepare themselves. This supper is both a participation in heavenly glory and an anticipation of the eternal marriage that will be fulfilled at the end of time. In other words, in the Eucharistic “marriage celebration” (Latin nuptiarum celebratio) Jesus the Bridegroom is united to the Church, not just in spirit, but in body as well. For while Jesus, as the divine Son of God, is spiritually present everywhere, in the Eucharist he is present bodily: it is the wedding banquet at which the Bridegroom Messiah is united to his bride in both body and spirit. What a grand vision of the Lord’s Supper! This is especially so when we recall the ancient Jewish interpretation of the Song of Songs as an allegory of the love of God for Israel as expressed through worship in the Temple. In the words of Jean Danielou, for the Church Fathers, the Eucharist was nothing less than “the kiss given by Christ to the soul, the expression of the union of love.” In this way, the Eucharist fulfills the longing of bridal Israel for union with her God. For the early Church Fathers, knowingly receiving the Eucharist in a state of grave sin is like recapitulating the “kiss” of betrayal given by Judas to Jesus in the Garden of Gethsemane (Luke 22:47-48). Here again, sin is not just about breaking rules; it is the betrayal of a relationship. The idea of the Eucharist as a wedding banquet is not something confined to the writings of ancient mystics or a few Church fathers. It too is part of the official teaching of the Catholic Church today. How many people today think of the Eucharist in this way, as “the Sacrament of the Bridegroom and the Bride”? Yet if love is defined as the gift of oneself to another person, then the Eucharist is the highest possible expression of Jesus’ spousal love for the Church. In the Eucharist Jesus not only tells the Church he loves her; he shows his love by really and truly giving himself to her, in both body and spirit, as the divine Bridegroom. Note well that this kind of self-gift is only really possible if the Eucharist is not just a symbol of Jesus - like a wedding ring, for example - but Jesus himself: his actual body, blood, soul, and divinity. The Eucharist is both a wedding supper and a wedding sacrifice. 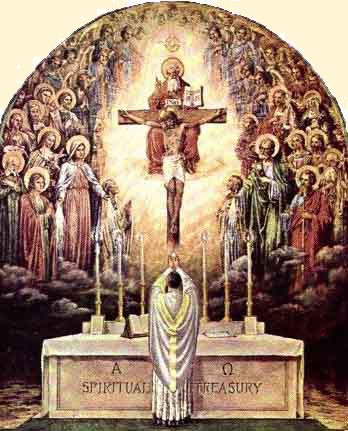 It is the “marriage supper of the Lamb” (Revelation 19:9), whose sacrificial love for the Church is expressed by the gift of his body and blood in the Upper Room and on Calvary. In other words, the Eucharist is a “nuptial sacrament” of both the Last Supper and the cross (Benedict XVI, Post-Synodal Apostolic Exhortation Sacrament of Charity [Sacramentum Caritatis], no. 27). If there is something that really annoys me, something that leaves me feeling cheated at Morning Prayer and Evening Prayer, it is the growing practice of truncating the Psalmody of the Office. I have discovered this even at Sung Evensong in some of our great cathedrals, at the very time when many Christians of less liturgical traditions are rediscovering the power of the Psalter, as well as its Christological sense. 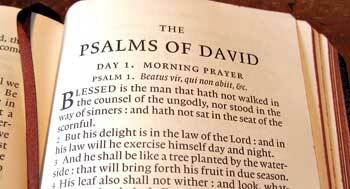 The archive of this blog already contains a wonderful piece by Thomas Merton on the use of the Psalms in our daily prayer. 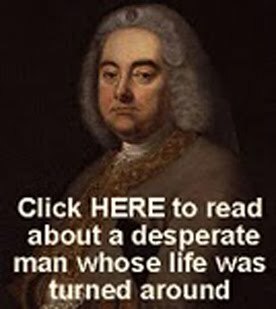 Today I share with you an important article on Dr Pusey and the Psalms, written by Dr George Westhaver, Principal of Pusey House. It was published in the Easter edition of the Church Observer, the Church Union magazine. 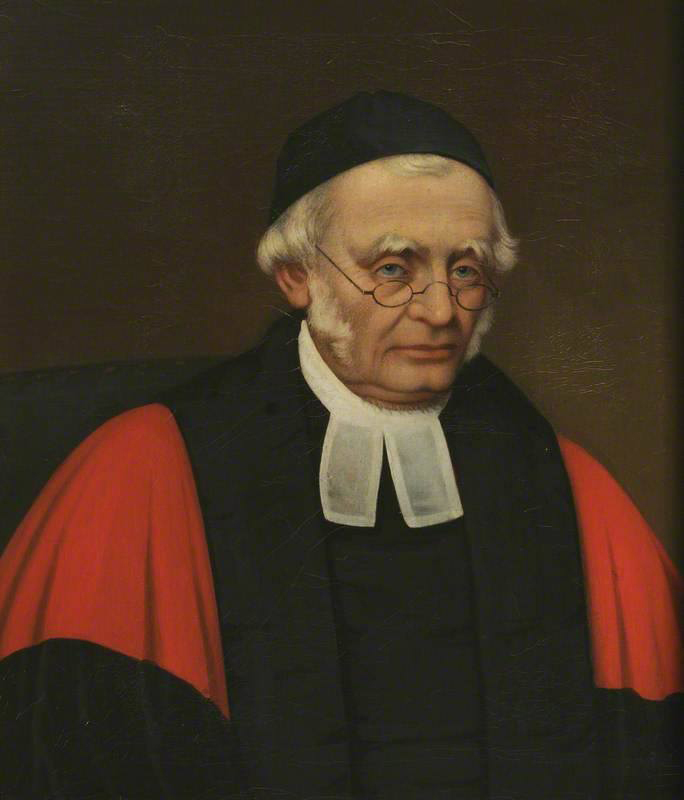 EVEN if his role as a leader of the Oxford movement was more than a decade away, the year 1828 was a momentous one for the young Edward Bouverie Pusey. In that year, at the age of only 28, Pusey became the Regius Professor of Hebrew at the University of Oxford. Also in 1828, and after ten years of delay and frustration due to the scruples of two sets of parents, Pusey was finally able to marry Maria Baker. In the same year he was ordained both deacon and priest and became a Canon of Christ Church Cathedral. The combination of these events is particularly fitting. For Pusey the prayers which described his marriage to Maria Baker as symbolic of the mystical union of Christ and the Church were not pious utterances to be left behind on the wedding day, but expressive of the basic reality which shaped his life and guided his work both in the University and in the Church. The union of the human and divine in Christ, the communion of the body of Christ with her Head, and the gift of the real and ineffable presence of the same risen and ascended Lord in the apparently weak symbols of bread and wine were for Pusey different aspects of one and the same mystery. The prominence which Pusey gave in his sermons to the Incarnation, the Church, and the Sacraments also shaped his understanding of the Bible. For Pusey, the importance of the Bible extended beyond the information it conveyed, beyond even its role, in the bosom of the Church, as a teacher of saving doctrine. Pusey also taught that the Bible has a kind of sacramental power by which it can serve as an instrument of communion, a means of participation in the divine life. In other words, the Bible does not just teach about the Incarnation, but rather, these “earthly words ... are full of the Word” and so communicate life to the members of his Body, the Church. In particular, Pusey emphasised the importance of reading and praying the Psalms. He argued that both the New Testament and the writings of the early centuries of the Church encourage us to see the person and the work of Christ as the primary subject matter of the psalms. For Pusey, finding Christ in the psalms means seeing how the whole of the Old Testament, the struggles and trials of the people of Israel, their hopes and failures, were prophetic both of what Christ accomplished and taught by his Incarnation, and of his manner of presence in his body through the indwelling of the Holy Spirit. If the Holy Spirit illumined David and Moses and the authors of the psalms, if the psalms have any place in the Bible, then the Spirit which inspires them testifies of Christ. This testimony is never incidental or secondary, it is the most important thing. This approach builds on the words of the Risen Christ to his disciples on the first Easter day when he told them that his teaching and work was prophesied in the psalms as well as in the law and the prophets (Luke 24.44). However much modern approaches have changed the way people understand the Bible and the psalms, the prominence of the psalms in Christian worships, and especially the selection of psalms for particular days of the Christian Calendar, arises from this traditional approach which Pusey represents. At the same time, Pusey’s emphasis on the psalms as prophetic of Christ does not mean that one denies the significance of the context in which they were written. Rather, the more we know about the authors of the psalms and the historical events which they describe, the more we will understand the particular way in which they reveal or speak of Christ and the Christian life also. While sometimes the psalms seem to be without any form or comeliness that we should see Christ in them (Isaiah 53.2), by the light of the Resurrection and the work of the Holy Spirit we recognize their profound beauty and truth. Hearing Christ in the psalms is a form of recognising the risen body of our Lord which is changed and made both more real and spiritual by the resurrection, but it is not destroyed. 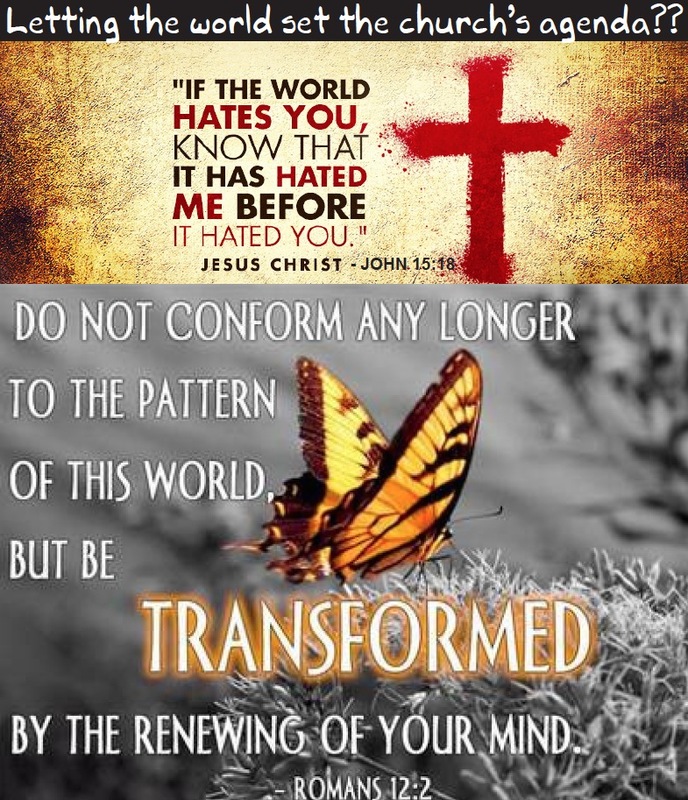 It is also because of this transfiguration of meaning that the Christian can read the curses of the psalms as expressions of the Christians struggle against sin, as words which reveal the character of love and the voice of Christ. Pusey’s interpretation of Psalm 40 exemplifies this approach: “I waited patiently for the Lord: and he inclined unto me, and heard my calling. He brought me also out of the horrible pit, out of the mire and day: and set my feet upon a rock, and ordered my goings. (Ps 40.1-2)” He finds in this psalm the prayer of the Son who waited patiently on the Father and who was raised on the third day from the pit of hell. In this Pusey draws on a principle which he found in St Augustine and in his fusion of Christ’s description of marriage with St Paul’s interpretation of the union of man and woman as symbolizing the bond between Christ and the Church:“If therefore He Himself hath said, they are no more twain, but one flesh, what wonder if, as they are but one flesh, they should have but one tongue, and the same as being but one flesh, the Head and the Body”. Pusey also emphasizes that the Psalms served as the prayers of Christ during the time of his earthly ministry: ‘“Thou shalt not leave my soul in hell: neither shalt Thou suffer Thy Holy One to see corruption” (Ps. 16.11). While Old Testament prophecy reveals what the Incarnate Son would accomplish and the Gospels describe his acts or communicate his teaching, “the Psalms (to speak reverently) shadow forth to us a reality beyond all thought, the thoughts with which He communed with his Father”’. 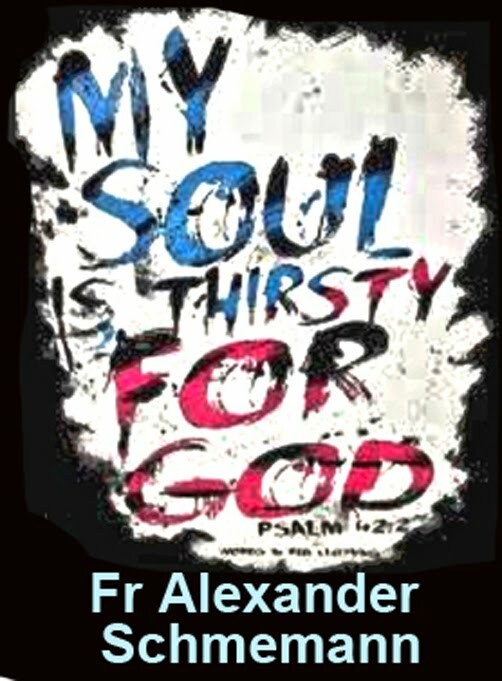 The psalms which both speak of the Head and serve as his prayers have a kind of “sacramental force as being used in Him, and being his words in us, addressed to the Father as the words of the Son”. Sharing in Son’s communication with the Father by praying the Psalms is a sacramental reading by which the members of the Body grow in holiness and, Pusey adds, are “fitted to receive the mind of the Spirit”. Pusey is well known for teaching that the Incarnation, the union of Christ and his Church and the communion of the life of Christ through the sacraments were different aspects of the same reality. He also described the Old Testament, and in particular the Psalms, as possessing a “mysterious virtue”, a power analogous to the “holy mysteries”, to the sacraments, to serve as a means of communion as well as a form of revelation. One might challenge the ardour of his language and the precise form of his argument. 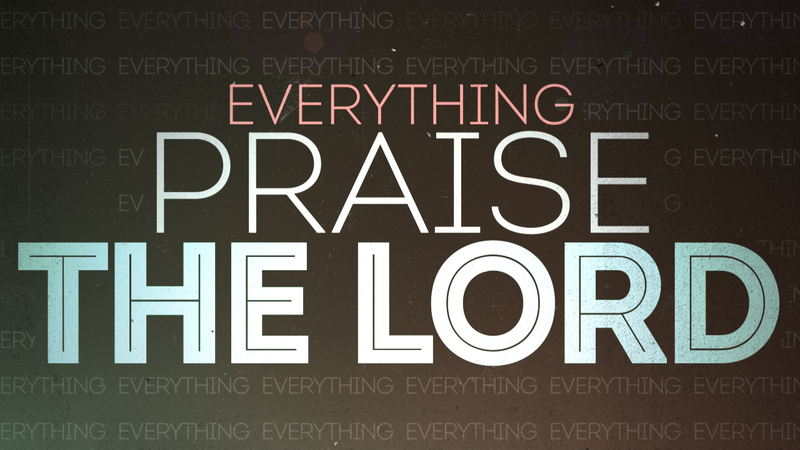 At the same time, we can learn from him the great privilege of praying the psalms in Christian worship and expect to find there not only the prayers of our own hearts, but also to hear and encounter the risen and ascended Lord. 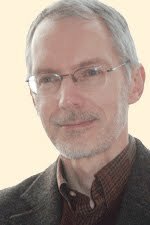 On July 17, Stratford Caldecott, the British Catholic theologian, author and editor died after a lengthy and painful struggle with cancer aged just 60. With his wife, Léonie, he was the founder of Second Spring, a journal of faith and culture, and also co-editor of Magnificat UK. A member of the editorial board of the International Theological Journal Communio, he was the author of a number of books, including: Beauty in the Word: Rethinking the Foundations of Education, Beauty for Truth’s Sake: On the Re-enchantment of Education and The Power of the Ring: The Spiritual Vision Behind the Lord of the Rings and The Hobbit. He was the G.K. Chesterton Research Fellow at Benet’s Hall, Oxford, and received an honorary doctorate in Theology from the John Paul II Institute in Washington, D.C.
Back in 1996 he co-ordinated an international conference of the Centre for Faith and Culture held at Westminster College, Oxford, on the subject of renewing the Church’s liturgical prayer. The papers were subsequently published. The paragraphs below are part of his summing up. Rich in beauty, profound in their understanding of God’s way with us, as well as of the nature of our response, they are “vintage” Stratford Caldecott. I share them with you in the hope that you will be inspired to read his books. May he rest in peace. “Worship . . . must be a whole-body, a whole-person experience. This fuller participation can best be promoted not by the introduction of more physical activity (hymn-singing, liturgical dance, etc.) but by the greater use of the senses in liturgy, as well as a greater sensitivity to the richness of metaphor and controlled ambiguity in liturgical language. 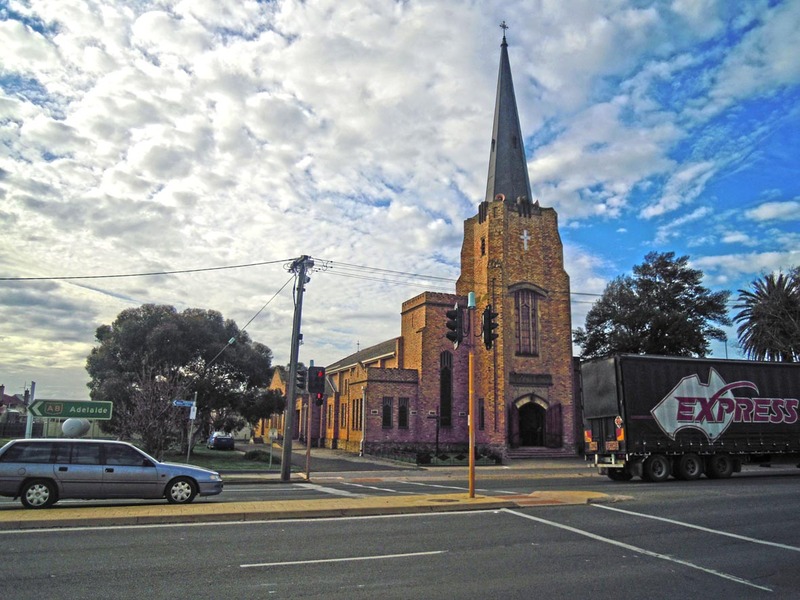 What we seem to be seeing, in general, is a growing awareness that beauty is a vital aspect of liturgical performance, conducive to ‘active participation’ in the deepest sense. The hope for a rapprochement with Eastern Orthodoxy, and the growing familiarity throughout the West with aspects of the rich Byzantine liturgical, theological and iconographic tradition (to a large extent already present within the Catholic Church through the Eastern rites), is another factor working in the same direction. The evident splendour and elaborate formality of the Oriental liturgies is not for all, but contact with it can still awaken an understanding of the original purpose of liturgy, and a longing for deep religious experience that may have been denied to those steeped in more action-oriented or secularised celebrations. “The auguries are therefore good for a widespread revival of Catholic spirituality in the next century [i.e. this century] - perhaps reinvigorated by the expansion of the Church in the Third World, and the development of innumerable new movements and communities from Taizé to Focolare, from Neocatechumenate to the charismatics. Religious consciousness in general is mystical poetic, sensitive to the many-layered meanings of symbolism, aware of the correspondences and analogies which bind the universe together. Catholicism and Orthodoxy provide a home for such a consciousness by being essentially sacramental. Even their ecclesial structures exist for the sake of the sacraments and the spiritual life these are designed to nourish. For this reason, any recovery of religious sensibility must in the long run work in favour of traditional sacramental and liturgical forms, even as it enriches and transforms them. 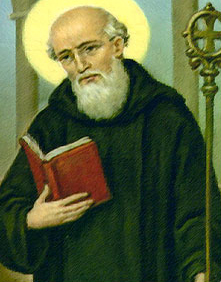 Today we thank the Lord for St Lawrence of Brindisi, who is honoured as a Doctor of the Church. 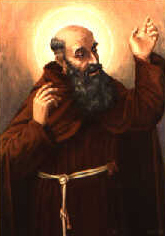 He was born Caesar de Rossi at Brindisi, in the kingdom of Naples, Italy, on July 22, 1559 but took the name Lawrence when he became a Capuchin Franciscan at the age of 16. While a deacon, Lawrence became well-known for his powerful preaching of the Word of God, and after his ordination to the priesthood startled the whole of northern Italy with his sermons. In 1596, he became a Superior in his order, and five years later went to Germany with Benedict of Urbino. They founded several priories throughout Europe. In 1602, Lawrence became the Master General of his order. He worked, preached and wrote to spread the Gospel. He also went on important peace missions to Munich and Madrid. The rulers of those places listened to him and his missions were successful. Eventually Lawrence was worn out by constant travell in difficult conditions and by the strain of his ministry. He became ill and died in 1619. But he lived and died for the Lord, and through his faithfulness many embraced the saving Gospel. Here is the passage set for the Office of Readings today. Would that all preachers today had such confidence in the power of God's Word! Who gets to decide if particular developments are right? Suppose that another Letter from the Apostle Paul to Timothy is discovered, and all the scholars agree that it is genuine. Suppose it contains some amazingly wonderful uplifting and spiritually nourishing passages, and appears not to alter seriously our existing theological paradigms. Suppose that some Christians think it should now be included in the New Testament and others say it shouldn’t be. The New Testament is a gift from God that we share with the rest of the Church Catholic. As a tiny minority of the Church Catholic, could the Church of England – or even a Lambeth Conference of the Anglican Communion – authorise on its own the inclusion in the NT Canon of that newly discovered Letter of Paul? Surely in such a basic area as the New Testament Canon our claim to be but part of the Church Catholic would impose serious constraints upon us, even if we ourselves favoured the proposed development. We simply could not say for certain ON OUR OWN that it is right. Why is it so difficult to understand that this is exactly the issue for many Anglicans with regard to altering the male character of the ordained ministry, a gift, which like the NT Canon, we have always claimed to share with the rest of the Church Catholic? The truth is that we cannot say for certain ON OUR OWN that it is right. At the very least, the theology of “reception” morally obliges provinces with women priests and/or bishops to make “proper provision” for those who oppose the development on the basis that it is has not been discerned as right by the rest of the Church Catholic. As part of the implementation of women bishops, the Church of England has decided to do just that. Provisions (meagre though they may seem) are being put in place that will enable those opposed on Catholic grounds to be assured in their consciences of an authentic Catholic sacramental life. It’s the very least that should be done. 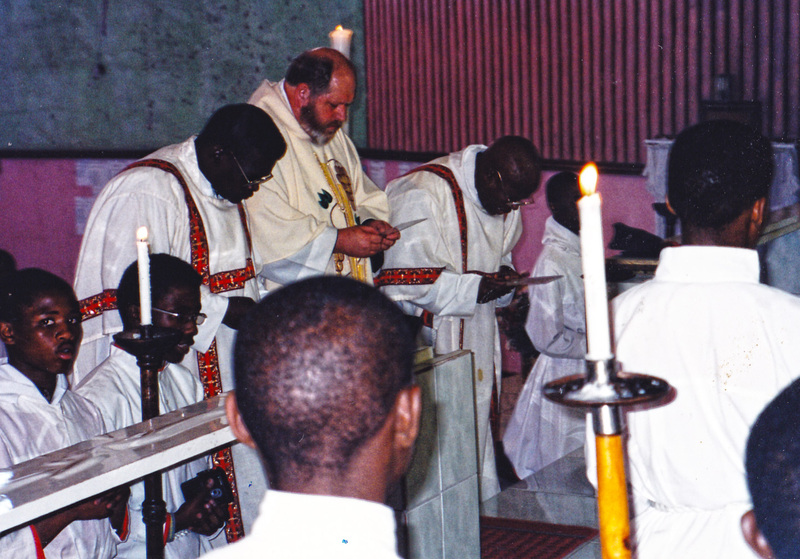 The question now is: Will other Anglican provinces throughout the world – including those who have so far acted ruthlessly towards the most Catholic of their people – follow the example of the Mother Church of the Communion? In the light of recent events within the Church of England, and reports regarding Forward in Faith (U.K.), the officers of Forward in Faith North America (FiFNA) hereby issues the following statement. First, it is with deep sorrow that FiFNA acknowledges the vote by the General Synod of the Church of England to proceed with the “consecration” of women to the episcopate. This action heightens the level of difficulty for Anglicans during this period of reception, by placing more barriers before those who are seeking to live under and promote the historic priesthood and episcopate. Sadly, the autonomy of the local church, albeit provinces, has usurped the authority and unity of Ecumenical consensus and the Church catholic, exposing yet again the ecclesial deficit of our Communion that can only be addressed through the historic tools of Conciliar discernment. For our brothers and sisters in the Church of England who maintain the worldwide majority position of the One, Holy, Catholic, and Apostolic Church regarding Holy Orders, we pledge our prayerful support, love, and respect. You have consistently upheld biblical and theological principles in an age of secularism. However, we are encouraged that this most unfortunate decision, has been accompanied by provisions enabling Catholic Anglicans to remain in the Church of England with integrity, and the Church of England’s stated commitment to enable them to flourish within its life and structures. Sadly, since the beginning of the ordination of women as priests in the Episcopal Church, and their subsequent consecration to the episcopate, those assurances were offered, only to be later withdrawn to faithful Catholic Anglicans (in the Episcopal Church). The many divisions, coupled with massive litigation, have produced an environment which we pray will not become your reality. 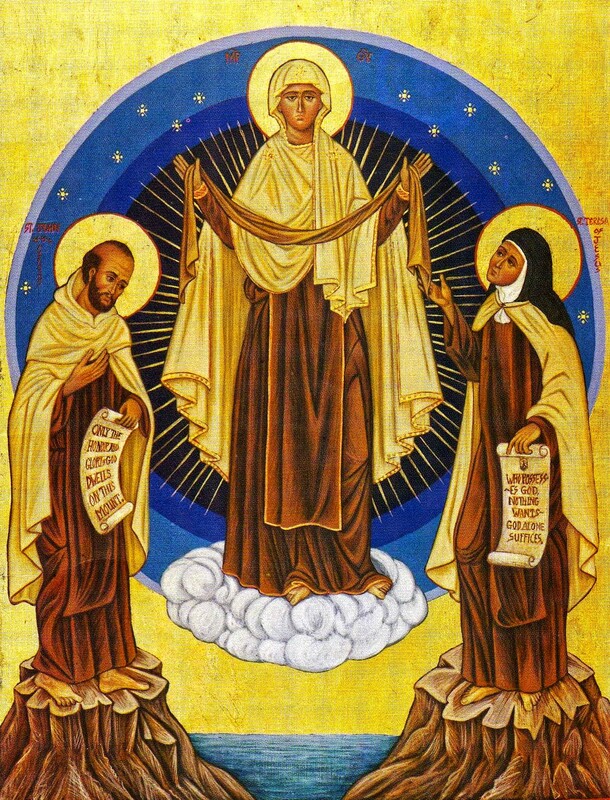 We also assure you of our prayerful support as you seek to develop “The Society” under the patronage of St. Wilfrid and St. Hilda, as the ecclesial structure for bishops, clergy, religious and parishes to live in full communion with each other within the Church of England, as you recommit yourselves to Mission. Although this became impossible in the Episcopal Church, we pray that wisdom will prevail for you in the days ahead. 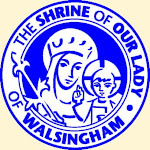 We also wish to thank all those who have worked tirelessly in simply restating what the Church has always believed, and in particular what became obvious to many people in Forward in Faith – the necessity of working with faithful Anglicans of various traditions that may in some ways differ from our own, for the sake of unity in Jesus Christ, who is the Way, the Truth, and the Life. With the General Synod in mind, and the problem of the Church's "credibility" . . .